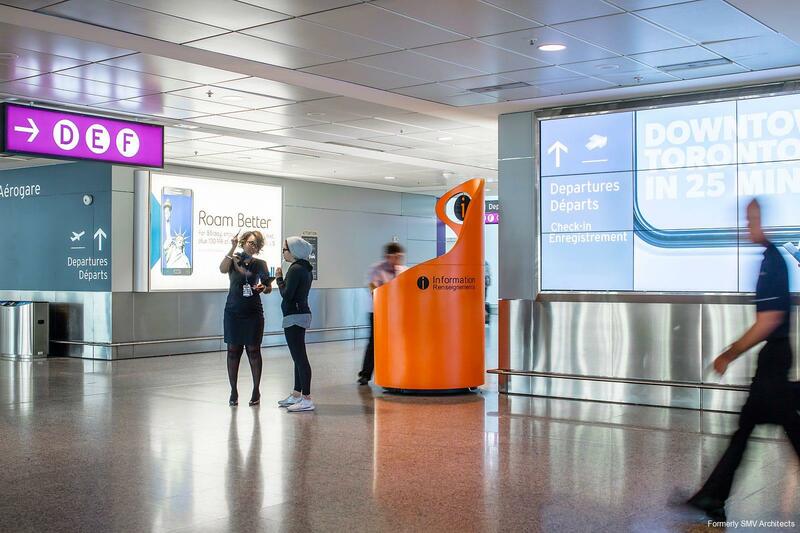 Despite their importance as the first introduction to a region, airport welcome centres are notoriously hard to find and frequently boring and utilitarian. 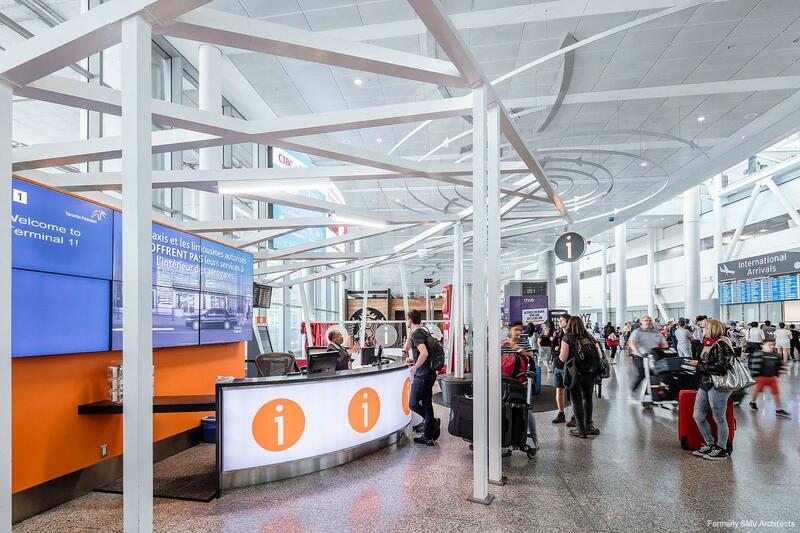 At Pearson, the GTAA wanted to refresh the dated centre in the International Arrivals at Terminal 1. They asked us to improve the visibility and function while retaining the existing open frame structure and within a limited budget. We transformed the dated, visually noisy space into a highly visible and hospitable meeting place that creates a positive arrival experience. 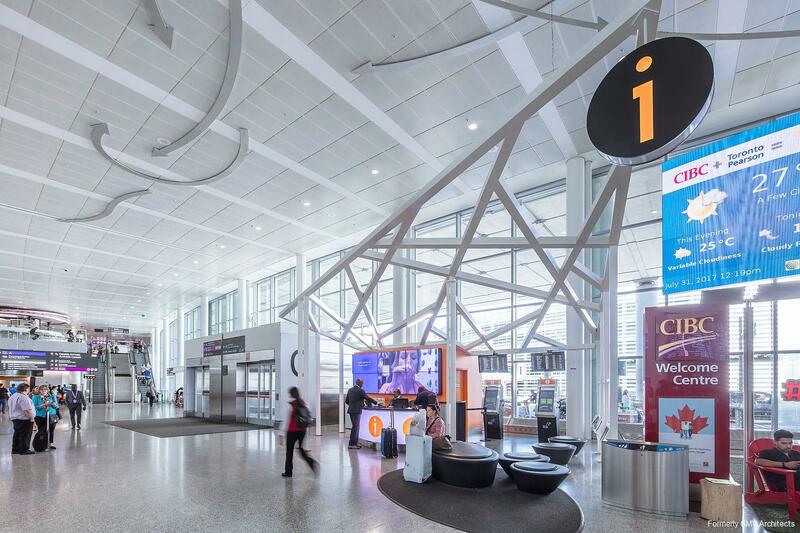 To make the centre more visible, we painted the formerly school bus yellow structure white to blend in with the elegant palette of the terminal and contrast sharply with the new welcome centre components. The fixed sign spelling out “Information” in French and English, was replaced by a large, black, rotating disk with a bright orange international “i”information symbol, which can be clearly seen from a distance, including from the bridges above. The existing storage room was painted out in matching orange. The existing counter was awkward and barricade-like. The new, graceful, round desk is more hospitable and easy to circumnavigate. With a series of orange i's on a backlit white panel, it is eye catching from afar. Brochure racks were relocated to the edge of the area, so that the desk is now devoted to one-on-one interactions between information agents and passengers. A large oblong carpet and a massive ottoman added to the existing three smaller units make it clear that this is a place to sit, while reviewing brochures and maps or waiting for fellow travellers. 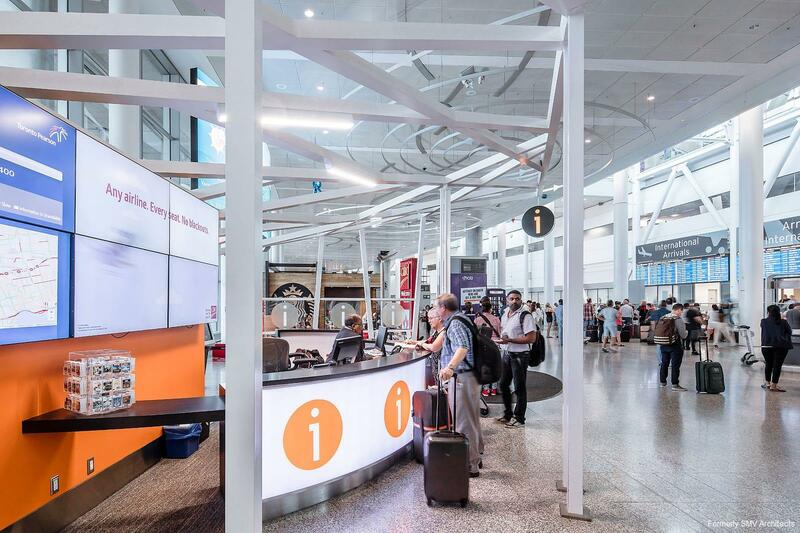 For passenger convenience, the welcome centre is supplemented by six staffed information booths strategically placed in Terminals 1 and 3. 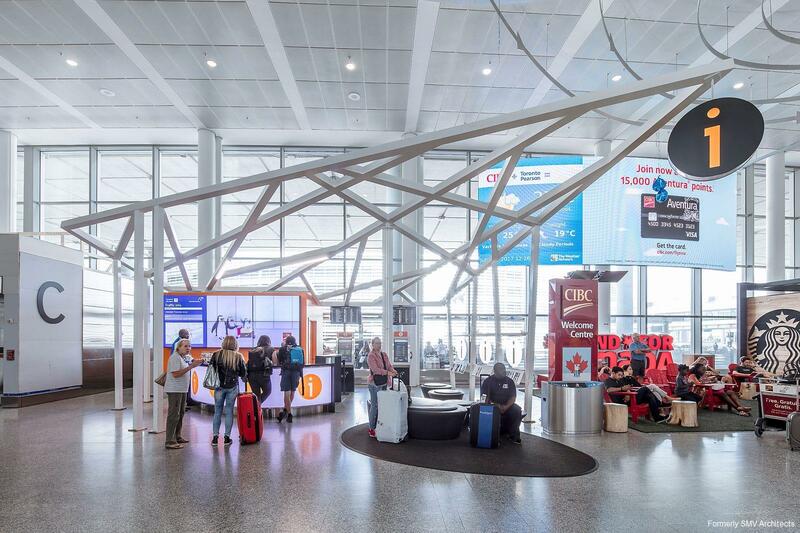 Our design for these highly functional and noticeable units won a GTAA competition. 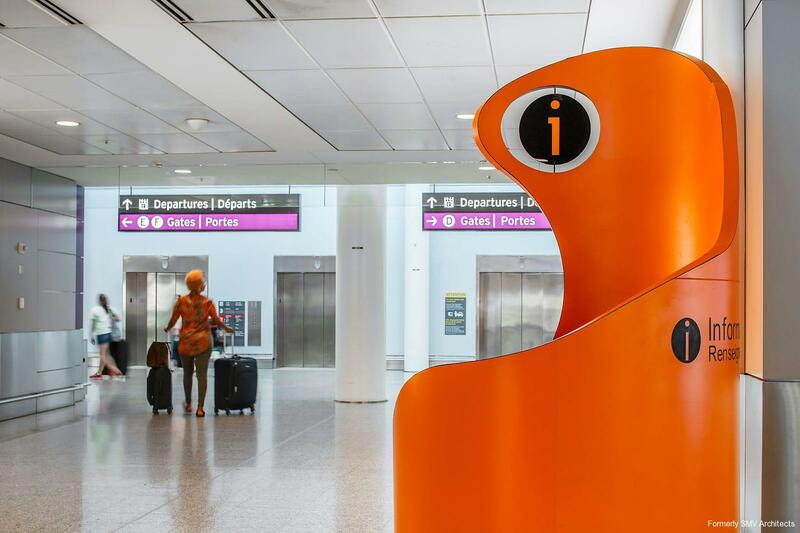 The bright orange, upward moving spirals, culminating in rotating i symbol signage, form exclamation points that stand out in the crowded terminals. Constructed of high-pressure laminate and fitting through any standard GTAA door, the light weight unit on lockable castors is easily moved. Inside, the unit contains lockable storage, a desk and a stool for the attendants. 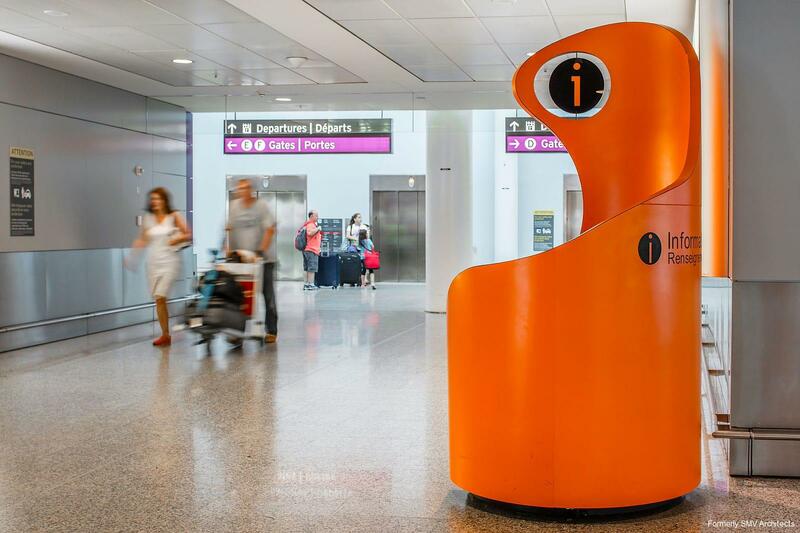 Simple, practical and droll, the bright little units cleverly solve an important challenge for the GTAA and passengers.